Last week, Uma Thurman talked about being injured in a car accident on the set of Kill Bill and alleged that Harvey Weinstein and CAA covered the accident up in a new interview. 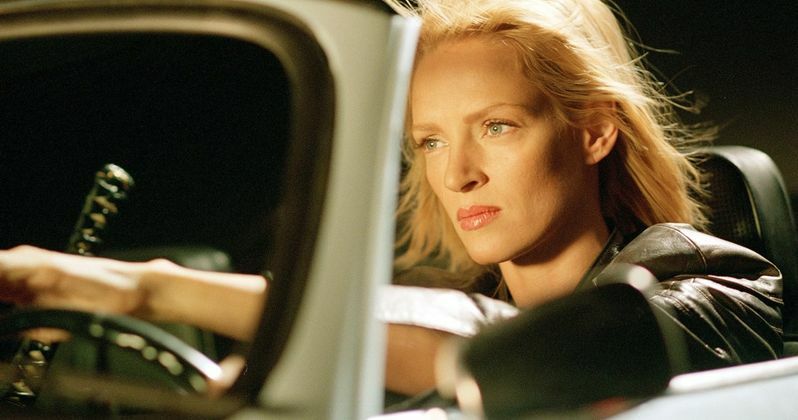 Thurman did not want to drive the car, but she was persuaded by Quentin Tarantino, who still claims that they didn't think that the scene warranted a stunt driver. Now, Kill Bill stunt coordinator Keith Adams is weighing in on the incident. According to Keith Adams, there were no stunts planned for the day of Uma Thurman's car accident on the set of Kill Bill. According to Adams, Tarantino hadn't even "notified or consulted" the stunt team before filming the scene. He had this to say. "No stunts of any kind were scheduled for the day of Ms. Thurman's accident. All of the stunt department was put on hold and no one from the stunt department was called to set. At no point was I notified or consulted about Ms. Thurman driving a car on camera that day. Had I been involved, I would have insisted not only on putting a professional driver behind the wheel but also insuring that the car itself was road-worthy and safe." The accident left Uma Thurman with a severely injured neck along with knee injuries as well as a concussion. The actress calls the decision to drive the car that day one of the "biggest regrets" of her life. Kill Bill director Quentin Tarantino talked about the incident earlier this week and maintains that he didn't think the scene required a stunt driver. The director says that he thought it was just driving and admits that he was a little irritated that Uma Thurman didn't want to drive in the scene. In the end, Tarantino got his way and the accident occurred. He had this to say. "None of us ever considered it a stunt. It was just driving. None of us looked at it as a stunt. Maybe we should have, but we didn't." Uma Thurman says that she was tipped off that the car, which was converted from a 5-speed to an automatic for the scene, was not safe. She then protested doing the scene, but Quentin Tarantino convinced her by saying that the road was just a straight shot. However, they changed the direction at the last minute and Thurman claims that the road was not straight. She crashed the car into a tree and suffered life altering injuries. The bad blood between Quentin Tarantino and Uma Thurman seems to have dissipated over the years and the actress compares their relationship to that of a brother and sister. It seems that the accident on the set of Kill Bill could have been prevented had they utilized a professional stunt driver to complete the scene, but it's all in the past now. Except for Uma Thurman's damaged knees and neck. You can read more about Kill Bill's stunt coordinator's thoughts on the incident over at Vulture.